Using our unique search and exit data set, we have analysed the behaviour of our users across our three main regions: Europe, the Middle East and Africa (EMEA), the Americas, and the Asia Pacific (APAC) region. For each, we have presented a set of insights into our users' destinations of choice, interest in travelling to global events, and travel planning behaviour. We have also used the distinction between searches and exits to identify areas with gaps between the level of interest and action taken for travel to a destination. As well as looking at our regional insights, you can read on for a global view comparing regional characteristics. From a global perspective, this gave five key insights. Firstly, for users in the EMEA and APAC regions, the majority (90%) of the top 10 destinations are within their own region. The only exception in both cases, is travel to the United States. For Americas on the other hand, only 50% of the most popular destinations are within the region, with 40% in Europe. Secondly, whilst users in the EMEA and APAC regions show little alignment between searches and exits, the top destinations from the Americas are strongly aligned. This suggests that users in the EMEA and APAC are taking a more exploratory approach to search, whereas in the Americas users are searching with higher intent. 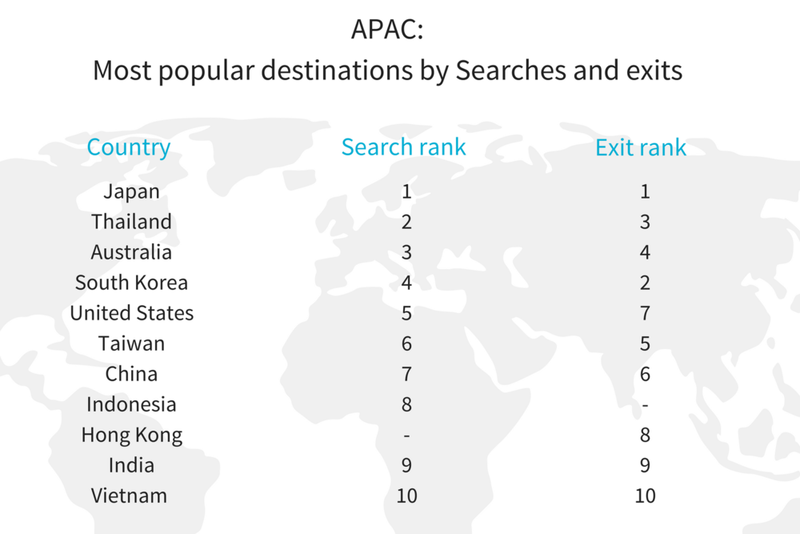 Looking at the growth of different destinations across the regions, both APAC and the Americas only have one destination that is growing in both searches and exits - Japan. All other growing destinations in the Americas are only experiencing a growth in searches - showing a trend towards more exploratory searches by users in the region. For EMEA on the other hand, all growth destinations are within the region and four destinations are experiencing a growth in both searches and exits: Portugal, Poland, the Netherlands and Greece. For long stay holidays, EMEA and Americas users are keen to take on the opportunity to discover destinations further afield; with 40% of EMEA top 10 destinations and 60% of Americas top 10 destinations being outside of the region. APAC users on the other hand still stay closer to home, with 80% of long-stay destinations within the top 10 remaining within the APAC region. Finally, with regards to high growth long stay destinations, we can see a continued preference by APAC users for travel within the region. For EMEA users on the other hand, 66% of growth destinations are within Asia. In the Americas, only two of the top 20 destinations are growing: The United States, which will clearly continue to reign, and the Philippines. To gain insights into the global events that drive the highest percentage growth during the month that they take place, we looked at 10 popular celebrations around the world. Of the global events that we investigated, Saint Patrick’s day and the Yi Peng Lantern festival are the ones driving the highest percentage growth for exits during the month that they take place. Saint Patrick’s day is the top ranking event in the Americas and EMEA. Users in both regions book their travel a similar time in advance – 113 days and 108 days respectively – but stay duration differs substantially – 10 days versus 5 days. The Yi Peng Lantern Festival ranked second across all three regions. Users from the Americas and EMEA booked their travel a similar amount of time in advance. APAC users on the other hand booked closer to their travel date. For users in the Americas and EMEA, the average length of stay was the same at 13 days. APAC users visited for a much shorter 5-day period on average. Overall the data suggests that distance travelled to each global event strongly influences the duration of stay, but has little effect on the time in advance that users book their trip. Travel planning behaviour is the area with the highest level of commonality between the different regions. All regions have their highest search volumes during the summer, and reveal Tuesday as the most popular day to exit on. When it comes to the most popular month for exits, EMEA and APAC have their highest exit volumes in July, whereas for the Americas region it is October through November. There is also a slight difference in the most popular day of the week to search. Although in the Americas and APAC Tuesday is the most popular, in the EMEA region Mondays ranked higher. Clearly, each region is entirely unique. Whilst there are some commonalities at high level, there are stronger differentiators. Particularly when you dive deeper into the data. So, whilst it is important to be global, it is also critical to act local. If you have not already done so, we suggest looking at our regional analyses to derive insights at these levels. If you are interested in diving deeper into Skyscanner user data for each region, you can contact us to learn more about our unique Travel Insight data.